All the partners have equitable responsibilities based on their expertise and willingness. The tasks assigned to each parner were discussed during the preparatory meetings conducted in Europe, China and Thailand from Nov. 2014 to Jan. 2015. The responsibilities have been assigned based on the ‘expression of interest’. Each partner has some SPECIFIC TASKS and some SHARED TASKS. 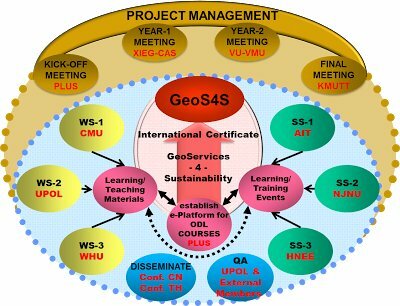 This project aims at developing 20 innovative modules which will be free‐standing without prerequisites, will complement each other, and have well designed interface definitions with different approved ongoing curricula as add‐on / plug‐in courses. Problem‐based teaching and Case‐study based learning have been demonstrated as superior pathways for acquisition of knowledge and competences, particularly in combination with flipped classrooms and ’active learning‘ approaches. Thus, all the modules will be casestudy based in various fields (applications, technology and data) addressing the developmental issues related to societal, economic and environmental sustainability.